Now I was pretty interested in this chart, since Andrew Gelman has taught me to be deeply suspicious of any reportedly wild swings in voting preference. However, looking a little closer I noted that he had the expanding gender gap as one of his 19 takeaways from the 2016 election, so I decided to take a closer look. What does it mean if a party loses a key demographic like that? 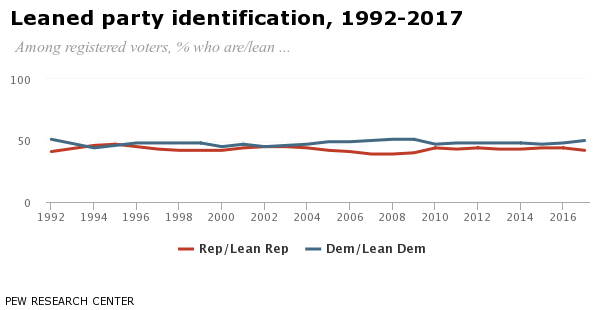 Note: preference is not the same as people saying “I’m a Republican” or “I’m a Democrat” (both of which are down), but what people end up actually voting. Anyway, I was curious why a massive drop-off in support from white college educated women wouldn’t translate in to a big jump in that graph, when it occurred to me that the underlying numbers are probably pretty different. Sure enough, per the Census Bureau, there are about twice as many Americans without a college degree (about 68%) vs with (about 32%). I can’t find exact breakdowns that take more than 2 factors in to account, but the same report shows that men and women have Bachelor’s degrees at about equal rates, and white people as a group have Bachelor’s degree at around a rate of 36%. The Washington Post puts the number of white people with college degrees at around 50 million, with the number without around 90 million. In other words, college educated white women are likely around 10% of the voter population, whereas non-college educated white men are likely around 20% of the total. A drop in one is made up for by the rise in the other. So what does this mean for elections? Well, it’s complicated. Unlike gender, educational attainment varies wildly by state. According to Wiki, my state (Massachusetts) has the highest percentage of people with Bachelor’s Degrees in the country (about 40%), almost double the rate of West Virginia at about 20%. Going just off the Wiki list, the top 14 states with the highest levels of Bachelor’s degrees actually all voted for Hillary in 2016. Assuming those degrees are somewhat evenly distributed by gender, this may mean the loss has already been felt and that any further change will just be driving the states further blue. Since the electoral college system is in play, this could make the impact on national elections even smaller. To complicate things in the other direction though, people with a Bachelor’s degree are much more likely to vote than those without one. For some reason the Census Bureau page that used to report this is down, but this site makes it look like the gap is pretty decent (80% for those with a Master’s or higher, vs 50% for a high school diploma). Again though, if the votes are unevenly distributed that could lead to less of an impact than you’d think. I’ll be interested to see what the mid-term elections bring for updates to these trends. Messiness ruins theories, but I have to complicate matters, because I think people could jump to conclusions here. BTW, thanks for that rundown of the numbers. Not all bachelor degrees are equal. In specific, there used to be more men than women getting them, and now are more women. If it is now even-up, then those college-educated women are going to be younger, on average. They are also going to be a lot less likely to have STEM degrees, and probably business. (I will never let you forget that you are an outlier and should embrace this.) I don’t know if there is a difference in age and major state by state, but i will bet there are regional differences. Fewer gender and ethnic studies majors in Mississippi and Idaho than in Mass and CA. College is also more about signalling every year. I don’t know if the education is worse, or if that’s just old coots complaining, but I’ll bet it’s not better. Still, I think Bannon is onto something real. Trump is culturally deeply offensive to people in academic, entertainment, and media culture, and women who have been to college and follow regular journalists are going to have a hard time getting past his style and attitude, even if they are long since off campus. Outside of any particular opinions or policies, he “feels” like an affront to societal progress for women. Something about him feels like the Bad Old Days. Engineering degrees are actually going up. Interestingly, this isn’t really a contradiction of what you said, because you were perfectly accurate for students who were in college a decade ago. These are the ones we’re starting to hear from of course, as they get their legs in the professional world. However, the ones right behind them have changed the trend again, and we’ll probably start seeing the effects of that in another decade or so.